You know, men always have the fear that baldness makes them unattractive, when, in reality, it is the fear itself that makes them unattractive. My two year old daughter gets some kiddie books in the mail every few weeks. One of the books showed the two characters making masks with one of the masks hovering over them. She immediately focused on that mask (you can see them here), so I told her that the "kid animals" were making masks and we could make one. She was quite upset by that suggestion. Her interest in pointing out the mask were purely based on a dislike for them. I had to turn the book over … but then she found another one on that side as well. So, I got this great idea, the next morning, I made a mask, but with a silly face on it-- even cut out a couple of holes for eyes, and she loved it. Now, she points to the masks on her book, but with a smile on her face. Masks have always represented our "inner fears" and since fears seem to get larger and more pronounced when they hide inside of us, masks have a way of bringing that fear out in the open … where we can face them directly. The goal is that once you face the fear, you can see it for what it is, and not be afraid. I had placed a strand of hair on its chin, and one on either side of the head, but as I looked at it, I realized that I should just leave it this way, as it represented my fear of baldness. Now, it isn't that I have this great fear of hair-loss, but my "high hairline" was always an object when the subject of male pattern baldness came up. 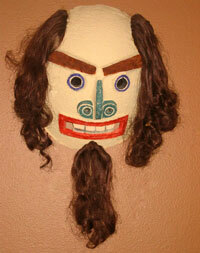 It has been many years since that time, but this mask has always adorned my dens (in fact, it is hovering on the far wall right now), and perhaps its presence has always given me a little less attachment to my locks. Originally written on 19 August 2003.